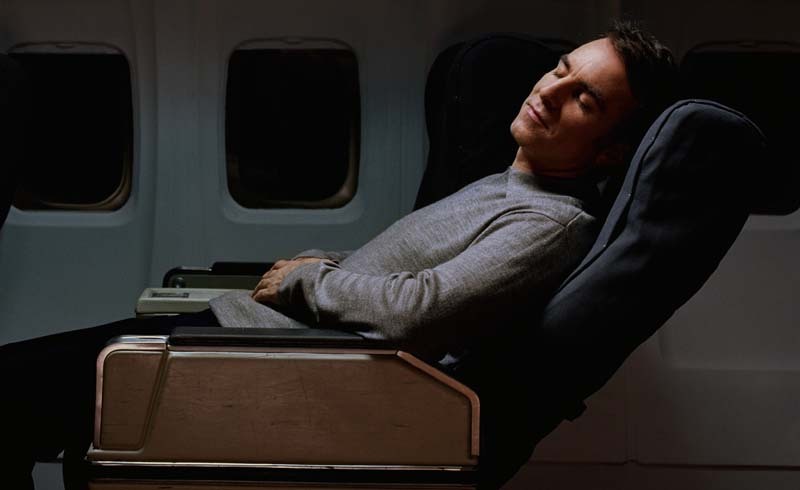 As a traveler, getting some rest on the flight out can improve your whole trip. Here are some expert-approved tips to help you doze off—no matter where you’re sitting on the plane. For some, sleeping on planes is second nature, where their eyes shut as soon as the cabin doors do. For others, in-flight sleep is an elusive, awe-inspiring skill that simply can’t be mastered. In reality, the ability to snooze on planes takes practice; categorizing yourself as someone who can’t fall asleep on planes will only make it more difficult to snooze. Resting your head is much easier if you’ve scored a lay-flat business or first-class bed, but several of these tips will make that economy seat feel much more comfortable. And as a traveler, getting rest en route to your trip is one of the most important things you can do—especially if you’re taking a red-eye, want to beat jet lag on arrival, or simply want to have the energy to sightsee when you arrive. We spoke to Anne D. Bartolucci, a professor at the Emory University School of Medicine and member of the American Academy of Sleep Medicine, for advice on how to get your body used to dozing off while 10,000 feet in the air. You may think a glass of wine will help ease flight anxieties and lull you to sleep, but in reality it can do just the opposite. Alcohol may help you fall asleep at first, says Bartolucci, who is a licensed psychologist and behavioral sleep medicine specialist, but it’ll further dehydrate you and force you awake if you need to go to the bathroom. If you want to drink something that’s not water, opt for a decaf tea. For long-haul flights, you might be inclined to try something stronger. Bartolucci says that if you’ve been prescribed something by your doctor, it’s a good idea to try the medication before you’re on the plane. Understanding the strength of your prescriptions before your trip will help you gauge how much you’ll need in-flight. She warns that taking too much of something could result in an incredibly drowsy first couple of days when you arrive at your destination. Potato chips and pretzels are snack cart staples, but they’re not great picks if you’re struggling to sleep. Bartolucci says it’s best to avoid salty snacks and preflight meals altogether since they lead to dehydration. Of course, you don’t want to be hungry on your flight, because that won’t help you sleep soundly either. If you can, plan to eat something mild about three hours before takeoff. Foods like bananas, nuts, and complex carbs like oatmeal or sweet potatoes have been shown to promote sleep, according to the National Sleep Foundation. Some might complain about the lack of glamour in jet-setting these days, but it’s a blessing in disguise that you’re no longer expected to wear your finest threads to the airport—especially if you’re taking a longer, international flight. Take advantage and dress accordingly: Layers are crucial because cabin temperature can be wildly fickle. Bartolucci recommends bringing an extra pair of socks to keep your feet warm as well as a jacket or hoodie that you can fold up and use as a makeshift travel pillow for lower back support. Also consider wearing looser fitting or stretchy clothes, since you’ll be sitting for a while and won’t want to be constricted. Traveling on an overnight flight or across time zones? Research suggests you should time your sleep based on where you’re headed. 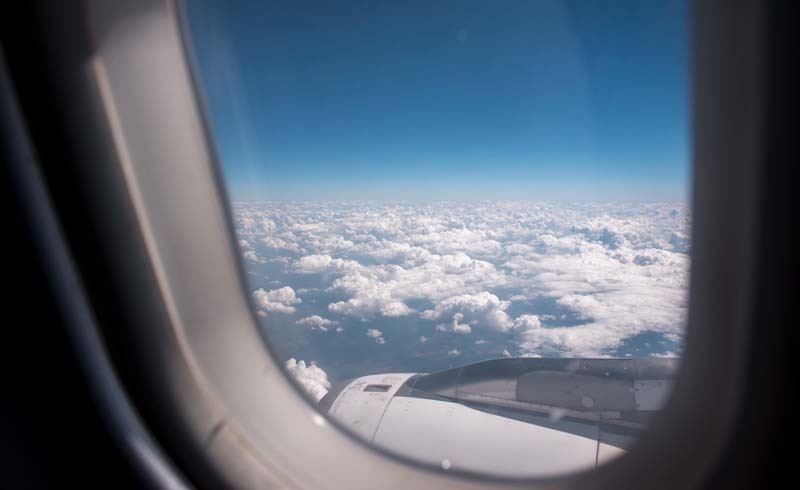 If you’re traveling east overnight, for example, you should try to sleep during the first half of the flight—or when it would be nighttime in your destination. If you’re flying west, stay up the first half and catch your rest during the second half to match the nighttime hours there. Your seat has a reclining option for a reason—use it, Bartolucci says. And if you’re able to choose your seat in advance, consider the often-overlooked window. This option provides a surface to lean against and lends itself to more positions to get comfortable in. The same is true for an exit row seat, which can give you more room to stretch out your legs. Bartolucci stresses the importance of neck comfort and support, so bring along a neck pillow or some kind of item that doubles as a makeshift head support. There are a couple of items that could make your journey to dreamland a whole lot easier. Bartolucci suggests investing in a pair of blue-light-blocking glasses; these will help eliminate your blue-light exposure from the TV screen and your devices, which can disrupt sleep. An eye mask, ear plugs, and noise-cancelling headphones can also be a huge help if you’re sensitive to light or noise. In-flight Wi-Fi has made it all too easy to stay online in the air. And while this can be a huge win if you’ve got work to do, the devices can also be a major hindrance toward your ability to sleep. If you need the rest, Bartolucci says to put your phone away for the flight; beyond sleep-disrupting blue light, the constant notifications while your phone is connected to Wi-Fi will activate your brain, which she says is a major “wake cue” and will prevent your mind from settling down. If you find reading before bed helps you drift away, consider old-fashioned paperbacks, or at the very least, an e-reader with smart light technology. The truth is, if you really want to sleep on a plane, you’ll have to give up on caring what others think of you. Yes, you might snore or startle yourself awake. And you might look kind of dopey when you discover that tray table in front of you is the best place to rest your head—and sometimes, it really is. Sleep is way more important than a glare from a judgmental stranger. You will probably never see most of the people on your flight again, so whip out your snuggie, recline your seat, and do whatever it takes to get comfortable.